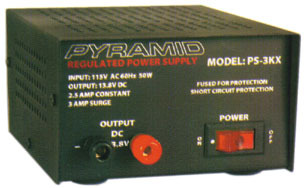 The Pyramid PS-3 KX regulated power supply provides 13.8 VDC at 3 Amps surge or 2.5 Amps continuous. Input is 120 VAC. The PS-3 is housed in a heavy metal case with non-skid rubber feet. It features a fuse, an illuminated on-off switch, surge and short protection. Output is to two screw type binding posts. The PS-3 KX features a heavy duty cabinet and heatsink with anti-skid rubber feet. Dimensions: 5 x 3 x 7.5 inches. Copyright 2002-2018, Universal Radio, Inc.